Not all thank yous are created equal. When it comes to thanking people for their charitable contributions, your approach matters. This isn’t the first time I’ve written about the value of saying thank you. I talk frequently about the importance of sharing stories to show how giving creates change. I’ve even written an eBook about the connection between communication and generosity. Today, I thought it would be interesting to bring the point home again by comparing and contrasting a couple of thank-you emails I recently received from charitable organizations. We can learn from others how to thank givers. They sent something near the end of the year. Whether the actual content of their thank-you message is terrific or terrible, their timing was right-on. Sending something to givers during the last month of the year is smart. My wife and I made a dozen gifts the last week of 2017, and receiving an email from organizations I care about put them and their cause in front of me at the perfect time—while we were actually considering year-end charitable gifts. They said “thank you.” Aside from being thoughtful, thanking people for a financial gift helps to build trust. It’s an awful feeling to click “give” on a website and have no idea if your contribution actually reached the organization. They made an ask. Often, charitable organizations (including churches) miss out on additional contributions simply because they don’t ask for them. They didn’t tell me how my previous giving made a difference. The message doesn’t “look back” and share what has already happened as a result of my contribution. The first bullet point begins with maintain. I don’t feel particularly motivated trying to “maintain” things. If you’ve ever led a debt-reduction campaign, or if you conduct an annual stewardship campaign for next year’s ministry fund, you know exactly what I’m talking about. People are excited by growth and fresh starts, not by maintaining the same-old-same-old. The third bullet is unclear. I don’t know what “empowering students to share our culture of service around the globe” means. Givers want to know where their money is going, and that statement doesn’t paint a clear picture for me. It uses an image. Photos grab readers’ attention—and videos are even more interesting. It’s specific. This message lists very specific outcomes of our support of the organization’s disaster relief efforts in Florida and Houston. It offers data. The paragraph below the infographic summarizes the data and shares the most exciting statistic of all: 600 lives were transformed by Christ! It’s clear. By reading this message, I feel confident that 100% of the money we gave went to the cause we chose to support. What Could Organization A Learn from Organization B? By modeling Organization B’s approach, Organization A could dramatically improve their results. The number of students who received scholarships this year. The total dollar amount of those scholarships. The average dollar amount per scholarship. 2. Describe progress toward a goal. The current average time between enrollment and graduation—and how that has changed in the past 20 years. The current average amount of debt students graduate with—and how that has changed in the past 20 years. Assures her ability to graduate on time because she’s not having to work two jobs while taking classes. Prevents her from having to rack up huge student loan debt to get her degree. Could Organization B Learn from Organization A? Yes. 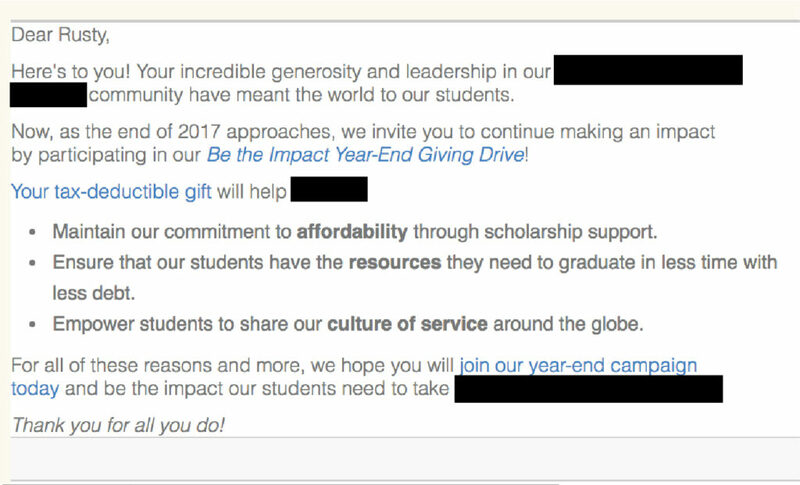 A simple closing sentence encouraging a year-end gift, placed after the signature and above the “Donate Now” button, would have strengthened this email considerably. How would you have written that sentence? Which Thank-You Email Inspires You? It’s pretty easy, isn’t it? Regardless of the cause that might resonate the most with your personal preferences, how the ask is presented directly impacts the likelihood of additional gifts. High-impact statistics, presented in a visual way, are most likely to capture the heart. While these two examples come from outside the church (one a university and the other a faith-based, disaster relief agency), you can apply these same techniques to your giving strategy. As you’re preparing your annual giving statement, include a great cover letter that screams IMPACT. The last thing your people want to read is another “help us keep the lights on” appeal. Do you need help developing an effective thank-you letter? I’d be happy to provide a free review of your upcoming giving statement cover letter. Email me today to get started.